Have I got the PERFECT Thanksgiving Centerpiece for you! It’s made from all natural materials (no faux anything here!) and it is easily transportable so you can take it as a splendid hostess gift to thank the one preparing the feast this year. Don’t let the rustic elegance fool ya… these are simple to put together and you might even have the supplies already in your home. Did you know you can just cut most succulents off at the base, and they will reroot wherever they are put? True story! And did you know they don’t need traditional soil to grow? They can grow in sand or even moss, like we are going to do here. What’s even more cool about this project is that you can just let the pumpkin decay as usual and then cut the top off and replant the entire design right into a pot or the ground! 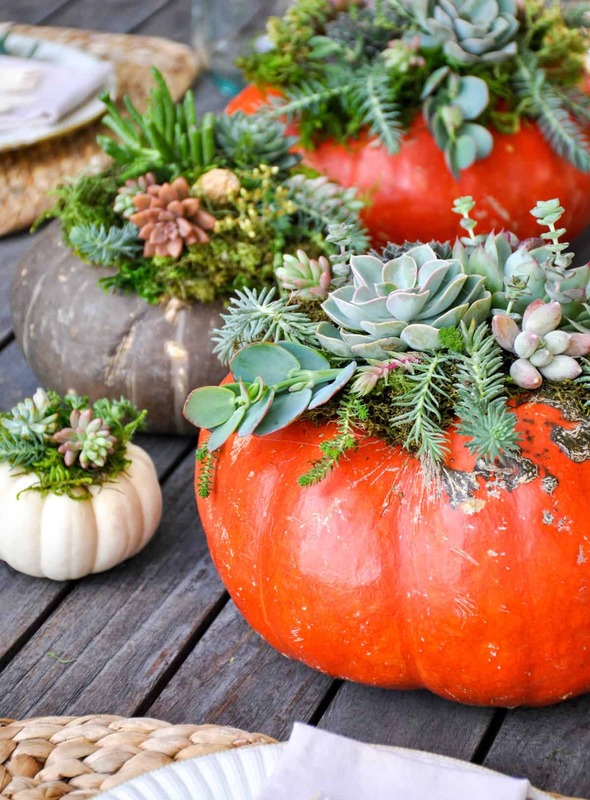 What you’ll need are pumpkins of your choice, moss, hot glue gun, and succulents in varyings sizes and types. Press a generous amount of moss and press down so the glue sticks. You may need to spot glue a few places to make sure the moss stays put. Or create a large grouping of gourds for the festivite table! Keep your arrangments fresh by using a spray bottle and lightly misting them once a day.